Green Haven - Gold Award for food hygiene and cleanliness. We hold a Gold Award for food hygiene and cleanliness. Breakfast is served between 8.30am and 9.30am in our ground floor dining room, at individual tables. 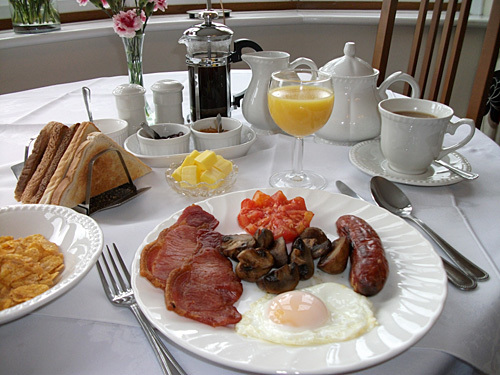 There is a variety or cereals and fruit juice to start, followed by your choice from a range of cooked breakfasts, including locally prepared sausages from Barry the Butcher, Barry's back bacon rashers, fresh mushrooms, grilled tomato and eggs - cooked the way you like them. Alternatively there is the full cooked vegetarian breakfast option (you don't have to be a vegetarian to enjoy this). Eggs fried, poached or scrambled with Irish potato bread, sautéd fresh mushrooms, grilled tomato and baked beans. If you would like a vegan breakfast or have any special dietary requirements, please advise us on booking and we will be happy to cater for you.